Display your love for the Lord Jesus with all thy heart in solid 14k white gold with this side by side Christian cross and heart ring for women from Apples of Gold Jewelry. "And he answering said, Thou shalt love the Lord thy God with all thy heart, and with all thy soul, and with all thy strength, and with all thy mind; and thy neighbour as thyself" (Luke 10:27). 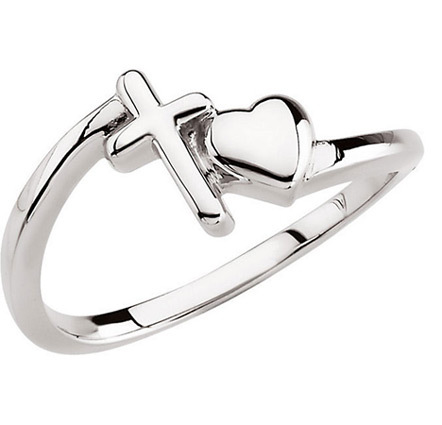 A unique polished cross and heart Christian ring which can be worn as either a women's Christian ring or as a chastity or purity ring. Available in sizes 4.5 - 9.5 for women. Ships free in the United States (international shipping available). Also available in 14k yellow gold or sterling silver (shown below). Apples of Gold Jewelry is a Christian-owned company, who affirms the Word of God as the final authority on all matters. It is our mission to honor the Lord Jesus Christ in our work, while spreading His Word to our neighbor. We guarantee our "With All Thy Heart" Christian Cross and Heart Ring, 14K White Gold to be high quality, authentic jewelry, as described above.